Pack contains a total 252 glue dots on 12 perforated sheets. Just tear apart at perferations to hand out to your group. 3/16″ diameter. 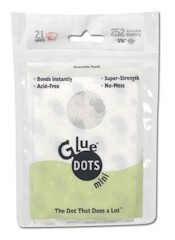 1 review for "Glue Dots"
Used for VBS craft. Glue dots worked great and so much neater than using liquid glue.